What is it? A (sub-)harmonic generator? 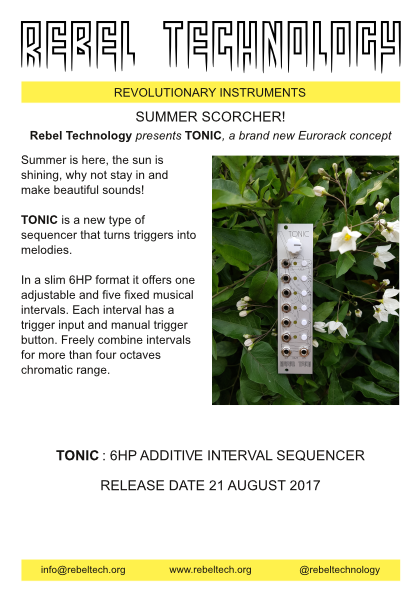 It's a new type of sequencer! We call it the additive interval sequencer. Feed it some triggers, and out comes melodies. In such case, I think it needs a brother called Gin that would convert CV to multiple triggers! I've just put a little demo video online, enjoy! The module is available now from our online store, and later this week from our distributors. Having +1 instead of -1 would make things easier for anyone counting in binary, but as it's retunable, that's not a big deal. I think that another interesting application would be to tune it with rational intervals (effectively tuning it to just intonation) and use that to set FM ratio. Should be especially fun with a complex oscillator if some of the triggers would be used with synchronized LFOs for modulation. Yes it's binary counting with a negative one! What you get out of the box is binary counting in whole tones using only +2 +4 +8 and +16. We tried a bunch of different tunings and this is what we found was both musical and flexible. You can still play every semitone over four octaves, but it's easier to make it sound nice (depending on your preference, as always). Great idea to do FM ratios with just intonation, I'll have to try that! 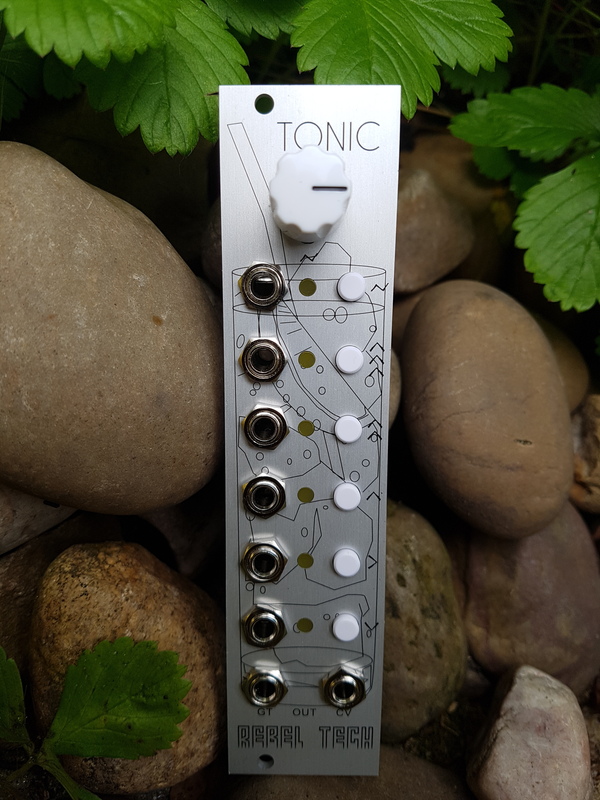 We're celebrating the Tonic release tomorrow Thursday with refreshments (yes, there'll be some G to go with the T) at our workshop in London Finsbury Park. All welcome, join us for a drink and try out our new, awesome module! This looks like a really fun module! I'm interested in getting one to be used with adders to be able to transpose sequences, however it would be amazing if the CV out was switchable between momentary and latch. Would it be possible to be able to add a switch on the front panel that would allow this to be possible? I think it would open up so many more possibilities! Thanks! Yes it works very well with a precision adder. Do you mean that you want an input trigger to toggle the state? They already latch for the duration of the trigger, or gate, that they receive.